There are 7 extant species of tarsiers, all in the genus Tarsius. Tarsier species are all similar in size, morphology, and ecology. They are all small, nocturnal, predaceous primates specialized for leaping and clinging. Tarsiers are the most “primitive” of the haplorrhine primates, with fossils dating to the Eocene. They were once widely distributed, fossils are known from North America, Europe, North Africa, and Asia (Niemitz, 2003). Tarsiers are found only in archipelagos in southeast Asia, including Sumatra, Borneo, Sulawesi, and parts of the Philippine Islands. 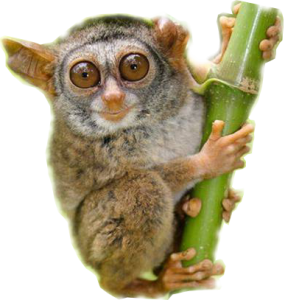 Tarsier species are all highly arboreal and are found primarily in tropical, forested habitats with dense vertical growth. They use leaping between vertical tree trunks or other vertical supports extensively to get around and this is an important component of their habitats. They may venture into non-forested habitats if there are sufficient vertical surfaces for clinging and leaping. They will jump to the ground to move around as well, but will only remain on the ground momentarily. Sleeping roosts in trees, hollows, and clusters of vines are also important components of their habitats. Most of their foraging time is spent below 1 m in the vertical structure of a forest. Sleeping roosts are mainly at 2 to 5 meters above the ground. (Niemitz, 2003). Tarsiers are small primates, weighing 80 to 150 g. Their fur is velvety or silky and buff, grayish brown, or dark brown on the back and grayish or buffy on the underside, generally resembling the color of dead leaves or bark. Species from higher altitudes sometimes have curly hair. Their most distinctive features are their round heads, remarkably large eyes that are directed forward, and their medium to large, hairless, and very mobile ears. Their eyes are so large that one of them weighs nearly as much as their brain.